Your body frame or bone structure can impact your ideal weight and your total body mass index, as well as your clothing size. Body frame sizes for both men and women are typically categorized as small, medium or large. Simple measurements can help you determine whether you are large or small boned. Accurately judge your body frame size to develop a reasonable goal weight, understand how your clothing fits and improve your overall body image. Approximate your frame size by wrapping your fingers around your wrist. If your thumb and index finger overlap, you likely have a small frame. If the two meet, your frame size is probably medium and you are large boned if they do not meet. Wrap the tape measure around your wrist to determine your body frame, according to Medline Plus. Note the measurement. Compare your measurements to frame size guidelines. For men, a wrist size of 5 1/2 to 6 1/2 inches indicates a small frame, while a measurement over 7 1/2 inches is typically of a larger bone structure. If you are female, your frame size will depend upon both your wrist measurement and your height. For women under 5 feet 2 inches, a measurement under 5 1/2 inches is a small frame, while a wrist over 5 3/4 inches shows that you have a larger bone structure. Women 5 feet 5 inches to 5 feet 7 inches are small framed if the measurement is less than 6 inches and have a larger frame if it is more than 6 1/4 inches. Females 5 feet 7 inches and taller are small boned if the wrist measures less than 6 1/4 inches and large framed if the wrist is more than 6 3/4 inches in circumference. Measure your elbow breadth. Extend your arm outward with your palm up. Bend the arm at the elbow to a 90-degree angle. Use your thumb and forefinger to grasp the bones at the elbow. Measure the gap between the thumb and index finger to determine your elbow breadth. Elbow breadth is considered a more accurate measurement of frame size, according to the IdealBodyWeightChart.com. See how your elbow breadth measurement relates to a normal frame size. A smaller breadth measurement indicates a small bone structure, while a larger measurement reveals that you have a large body frame size. 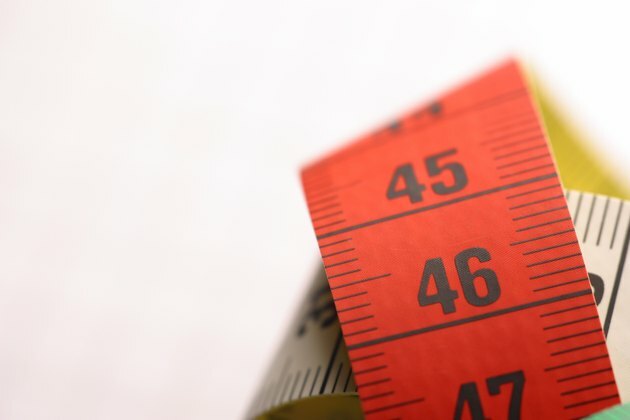 If you are female and between 4 feet 10 inches tall and 5 feet 3 inches tall, a measurement of 2 1/4 inches to 2 1/2 inches is typical, while 2 3/8 inches to 2 5/8 inches is normal for women between 5 feet 4 inches and 5 feet 11 inches. If you are female and above 6 feet tall, 2 1/2 inches to 2 3/4 inches is typical. Men of short stature should expect a normal elbow breadth measurement to be 2 1/2 inches to 2 7/8 inches for height under 5 feet 4 inches, while 2 5/8 inches to 2 7/8 inches is typical for men between 5 feet 4 inches and 5 feet 7 inches. Males 5 feet 8 inches to 5 feet 11 inches usually have an elbow measurement of 2 3/4 inches to 3 inches. From 6 feet tall to 6 feet 3 inches with a normal bone structure have a breadth measurement of 2 3/4 inches to 3 1/8 inches. A man over 6 feet 4 inches should expect a normal frame size to result in an elbow breadth of 2 7/8 inches to 3 1/4 inches. Use a calculator, like the one at MyFoodDiary.com, to figure out your frame size with either your wrist measurement or your elbow breadth. What Are Considered Big Biceps?